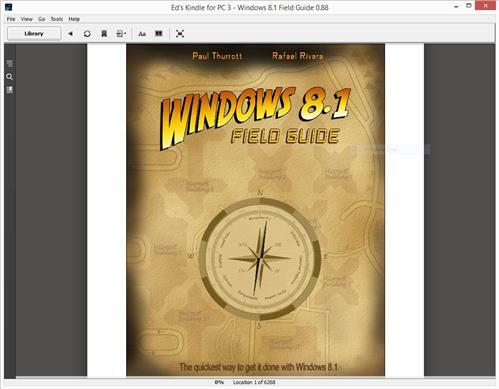 The book is (almost) done, but how to read it on Kindle in Windows 8.1? Because I’m running Windows 8.1 I assumed that having installed the Kindle reader for Windows 8 I’d be able to access the book immediately through the app. But after trying the double-click on the file, I got the “choose an App” dialog box from the OS rather than an immediate launch of the program. After I found myself unable to successfully penetrate the mysteries of the .../Program Files/WindowsApps folder, to target the Kindle app directly (I need to spend some time fooling around with this to see if there’s a way to do this when an item like the Kindle app fails to show up on the list of available apps that Windows presents by default), I realized this wasn’t going to be as easy as I’d thought. Some poking around online quickly convinced me that there’s no easy way to do this with the Windows 8 version of the Kindle reader, so following suggestions from other trailblazers who walked this path ahead of me I “downgraded” to the Windows 7 version of the Kindle reader instead. At last, I found myself with a version where I could access the built-in controls, upon which I learned that the easiest way to access any Kindle document is to copy it into the .../Documents/My Kindle Content folder. Once I accomplished this feat (which required me to do some additional online spelunking to identify the default repository for “local content” in Kindle parlance), I was finally able to access the book inside the Kindle reader.